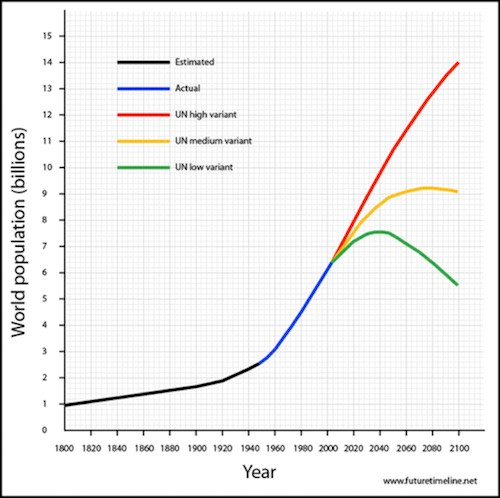 When I was a boy, I can remember the Zero Population Growth (ZPG) movement, which was a response to the Club of Rome‘s Limits to Growth Mathusian thesis of “the world has limited resources, but human population is rising exponentially and therefore ecological disaster looms”. Somewhere along the way, birth rates fell in response to global industrialization, rising incomes and changing incentive structures. In an agrarian society, children are potential units of production. They can be put to work in the fields and support you in your old age. In an industrialized society, children are cost centers. It was no wonder that birth rates fell as the emerging market economies boomed. John Mauldin addressed many of these issues in his essay Welcome to the Pale Grey Dot. 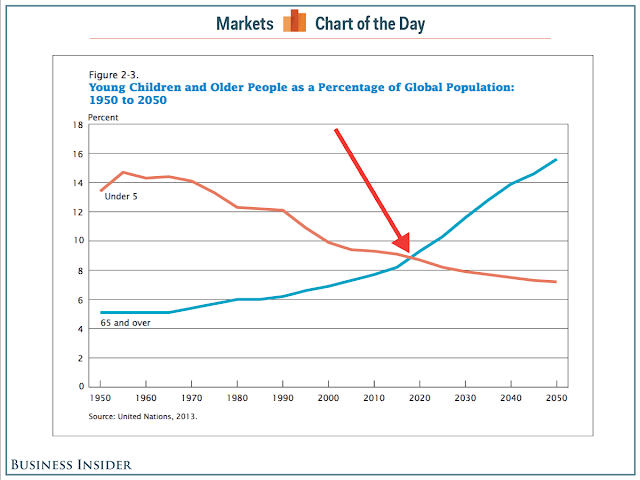 The world is indeed aging and it will cause a retirement crisis. The only question is one of timing. Matthew Tracey and Joachim Fels at Pimco have a more sanguine view in their essay 70 is the new 65. They argue that the traditional way of thinking about dependency ratios, like this chart below, is all wrong. 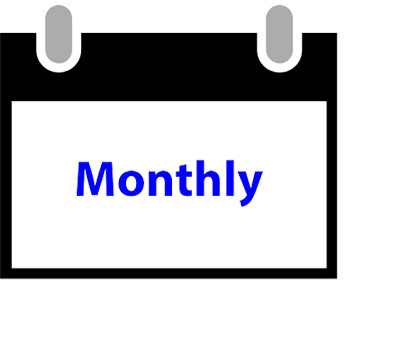 Instead, they calculate a modified dependency ratio based on a re-defined “peak savers” and the saving activity of seniors as they age, as life expectancy have risen. 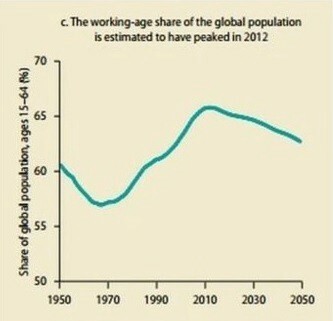 Based on these calculations, the demographic cliff is delayed by about ten years. I believe that the focus by Mauldin, Pimco and many other analysts on the coming demographic cliff is overly myopic as it only shines the spotlight on the social liability side of the equation. If we view the problem using an asset-liability framework, the bigger question is how society as a whole responds to an aging population. How can society generate sufficient wealth and growth to provide for its swelling number of seniors? The problem about rates of return on invested pension assets and pension funding ratios are issues of how to split the inter-generational pie. That question will become a matter of social debate that likely gets decided at the ballot box. Unless the pie is big enough and growing fast enough, nothing matters. Equally important and related to my previous point about the size of the pie: How will businesses respond in the face of a shrinking global labor pool? They enlarged their labor force, as female participation rose. As an aside, labor force enlargement could also be accomplished through higher immigration, but Japan did not go down that road. In a separate FT Alphaville post, Klein demonstrated that the US could also enlarge its labor force through better female participation. Just look at the gulf in female participation rate between American and Canadian workers. Bloomberg also reported that an increasing number of Americans plan to work until 70, which also raises the size of the work force. In addition, Japanese corporations invested – a lot. 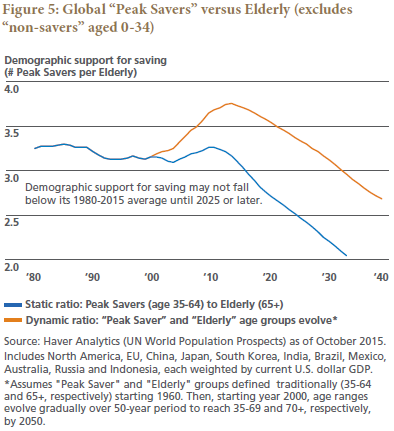 True, the Japanese household savings rate collapsed just as its demographic profile predicted. But the current account soared, as Japanese corporations raised their savings rate and invested overseas. 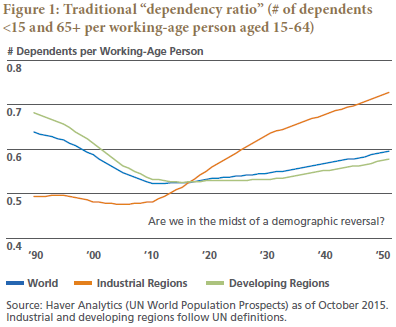 Demographic Apocalypse Not Yet – even in aging Japan. On the one hand, the world is undergoing a demographic transition and the one off impact of China’s entry into the global economy may have run it’s course. The WSJ article that helped clarify my own thinking was on Arizona and the impact of a multi-year crackdown on illegal immigration. The state provides a neat case study of what happens when a labour shortage develops. But faced with a shortage of workers and rising costs, capital responds. The labour market doesn’t operate in vacuum. Mr. Knorr says he is willing to pay $20 an hour to operators of harvesters and other machines, compared with about $13 an hour for field hands. Take away cheap labour and business models that rely on it existing will adapt or die. The way to adapt is to investment in labour-saving technology. 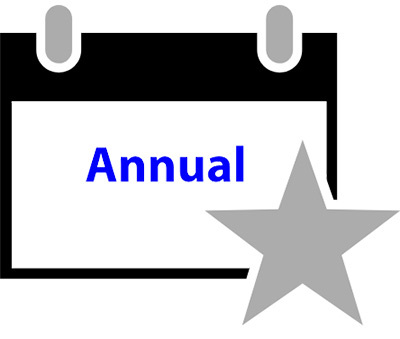 So far, the trends I have outlined so far is already known. Businesses are responding to a labor shortage by investing in automation. Aggregate output will not fall. Society will be able to take care of its seniors. How it re-distributes the fruits of automation is another question that will have to get decided at a level that’s beyond my pay grade. This brings up another, but more speculative point. Branko Milanovic pioneered a study showing how global inequality has changed over the last thirty years. Much of the gains from globalization and offshoring accrued to the middle class in the emerging market (EM) economies and the very rich of the world, because it was the top 1% that directed and reaped the fruits of globalization. The losers were the people in the subsistence economies, because those economies were not sophisticated enough to participate in the global labor rate arbitrage, and the middle class in the developed market (DM) economies. 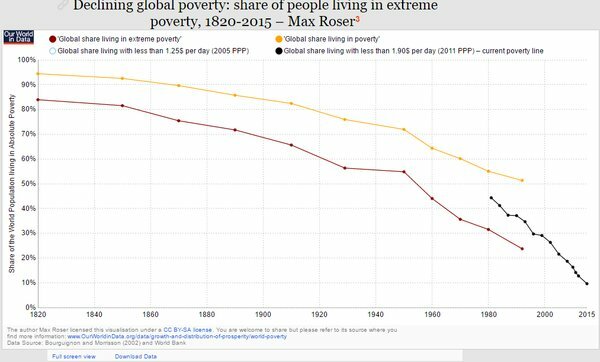 …and how poverty rates have plummeted. “This would not have been possible ten years ago,” Venkat Venkatakrishnan, the CEO of a unique and famous maker space called FirstBuild, told me in Louisville earlier this year. FirstBuild is unique because it was created by GE, as a subsidiary of its appliance division and as a deliberate effort to bring the nimble maker spirit to its design process. “What has changed is that the maker movement has figured out a group of technologies and tools which enable us to manufacture in low volume,” Venkat (as he is known) said. Big manufacturers like GE built their business on high-volume, factory-scale, very high-stakes production, where each new product means a bet of tens of millions of dollars. FirstBuild is mean to explore smaller, faster, more customizable options. Such a revolution in 3D printing and specialized manufacturing would shorten the supply chains in both distance and number of nodes. It also suggests a reversal in the labor arbitrage advantage that has benefited the EM countries in the last 30 years and the start of reshoring back to the developed markets. If that becomes the case, global inequality is likely to increase over the next 30 years, which will be a headwind for EM investors, while the winners will be the technology leaders who stay at the top. This also would be a welcome development for the embattled middle class in the developed market economies, which has seen populism and tribalism rise, especially in Europe (see The Brexit Pandora’s Box). To be sure, not all EM countries will lose under such an arrangement as trade patterns would shift from global to regional in nature. The countries that can offer the combination of low labor rates and proximity to markets, such as Mexico (NAFTA bloc), Eastern Europe (EU), China and South Korea (Asia) are likely to become the comparative winners within the EM economies. We are just as blind as the Club of Rome was in the 1970s. Just as willing to fear the future. I heartily recommend the book “The Rational Optimist”. It describes how the human race has always adapted to problems. The digital revolution will have an unimaginable impact in all areas of life. Take Healthcare. AI will aid remote diagnosis and treatment. So instead of huge future cost increases, costs will fall. In the area of demographics when statistics say that numbers of young people versus old will fall hurting the economy, I disagree. Simply counting bodies is wrong. For example in China one digital savvy young person entering the workforce will produce more than dozens of retiring old-style farmers. Numbers lie. Nicely put! Counting bodies of old people and the young couldn’t be more wrong in that kind of scenario. One would think that in a rapidly rising economy like China the difference between the old and the young could be significant in terms of value added. Regarding business investment, my layman thinking is that the lack of biz investment will get remedied by rising wages and especially after several years in the doldrum new technologies may exist and finally come into the awareness of business leaders that may have pent up demand for capex spending. Thus propelling a sudden jerk of investment spending before China come crashing down with its debt load in few years time. Happily, the demographic bulge problem — how to take care of the hordes of pensioners in the future — is oftentimes quite trivial. In Germany, all it needs is for the age of pension begin to increase by another 2-3 years. (The politics are not trivial, but the solution is). I also find reverse migration fascinating. I know some oldish folks who have firm plans to move to Thailand when they get wobbly. There exists there a first-rate system of nursing homes for western people where you get friendly, luxury care for a fraction of what it would cost in Europe. Anyway, Cam: quite excellent post, once again! Hmmm. My sister is an Ontario physician and nothing the commenters here are saying aligns with what she experiencies daily or her predictions for the future of Canadian medicine and senior care (most people don’t want to live and die among strangers). Not to mention that diagnosis and treatment are very complex and emotional issues already all too inhumanly delivered in a hastiy manner with spotty follow up among too many different physicians. Euthanasia will probably play an important role in cutting down costs too but I’m not sure if that demonstrates success or failure of the system.